For Anup Patel, the move into a challenging executive MBA program meant the expected assortment of demands. He hit the books, crunched the numbers and attended the lectures. But he also faced a particular test beyond any final exam question: How would he balance the demands of work and home with graduate school? "When I started the Executive MBA program at Florida Atlantic University, my son had just turned a year old," said Patel, who graduated in 2012. Here's how he made it through: "I have a very understanding wife," he noted, laughing. "And FAU was fantastic. The weekend EMBA program is such that a lot of things get taken care of for you, so that you can concentrate on doing the work and getting that knowledge." Between spending time with his family at home, Patel also found a band of brothers and sisters in his FAU classmates. It's the kind of camaraderie that only comes when an academic group learns and grows together. "In class you get to know the people and it's a strong support system," he said. "I made friends in the program that I still hang out with." Though negotiating the demands of a job, family and education would have been next to impossible without the school's help, Patel said, he also enacted a plan to guarantee his success. By taking the classes every third weekend, he was able to keep his work schedule intact. He reserved weekday evenings for studying and, where he needed it, supplemented the live lectures with FAU's online content. "Obviously there were times when I could not make it to class, so using Blackboard and the recorded lectures definitely helped me with the learning aspects," he said. "And for midterms and finals, I definitely used the online resources." Accommodating students such as Patel is core to FAU's academic mission in the 21st century. 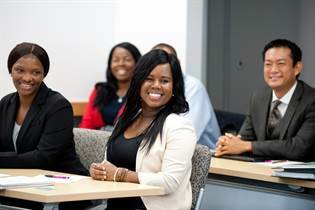 "You can work around your schedule where you will not have to sacrifice between income, home life and education," said Ken Johnson, Ph.D., professor and associate dean of graduate programs at FAU's College of Business. "We don't want students to sacrifice, and they don't want to sacrifice either." So it comes down to a choice: "Are you watching the class live or on a delayed basis? It's very normal for students to be up at three in the morning and they can be reviewing the class material. Our recorded lectures allow for flexibility "” without our reducing the rigor or content of the course," Johnson said. Even with the high-tech tools, Patel said, a student seeking to earn an MBA while juggling work and family has to manage time well. "It's also a lot of mind over matter. You miss attending a lot of social events, but it was just for a two-year period to make sure I made the most of the opportunity." That Patel capitalized on his MBA is putting it mildly. His career had begun six years ago at NextEra Energy Resources when he got a job as a lab chemist after graduating the University of California at Davis with a biology degree. "At the time my son was born, I just decided, "˜I've got to do more for him,'" Patel recalled. Yet the decision to pursue an MBA was more than just financial: "Obviously the caveat is that it's got to be something you want to do "” you can't just dabble in it. But if it truly interests you, you can get the most out of it." After graduating from FAU, Patel moved into a position at NextEra as a business services technician, which he occupied for a year before assuming his new post as business analyst. It's meant a 33% pay increase "and career-path wise, it's been better, too. I now have an even better work-life balance and I know that advancements can be made with the degree. There's also a level of respect that's earned by obtaining it." That dovetails well with satisfaction Patel gleaned along the way to his MBA. "The FAU professors were unbelievable "” helpful and insightful," he said. "And I was very grateful that I chose the path of being there in person to network, to make new friends. As a whole, I always look back on it with great affection and happiness."